Waiting on Lem and Oakley's max effort build results! Carl wrote: The engine appears to be the same configuration as used in the previous article were the 270's made 75HP more than unported SCJ's. Interesting P-51 vs. TFS. If I recall correctly Blake Cartwright has gone some 5.60's on motor with the TFS. Gary, do you think when people are looking at making 4 digit horsepower they are usually steered towards A460 or C460 heads and that's why we don't see many proven 1000 hp P-51builds? 68formalGT wrote: Gary, do you think when people are looking at making 4 digit horsepower they are usually steered towards A460 or C460 heads and that's why we don't see many proven 1000 hp P-51builds? Makes sense Joe. More potential for future growth. I would also add that typically the heads up racers set the trends that trickle down to the budget minded bracket racers and test n tuners. With the majority of big block, heads up stuff allowing A460s, the development of the P51s hasn't reached its peak probably..... and I don't see high end used P51 parts out there like I do A460 stuff. Lol. Wow, good catch. Restrictor plate??? That's clearly the case. Most people don't have a 1,000 hp budget and those that do mostly go to A460 heads. Or class restrictions like factory intake and exhaust manifold bolt patterns. Seeing the peak rpm hp on good heads and large cam. Then constantly seeing fools saying there stock rotaters rev 7000, yet dont have more the 250-260@050 cams with dove heads. I just shake my head knowing that they are done well before 7000. This is why you can't race dynos. Different conditions, different correction factors, etc. At the end of the day, the AFR test was done on the same dyno, on the same engine, by the same dyno operator, under the same conditions. If you think Westech Performance and Steve Brule are going to jeopardize their hard earned reputation by allowing somebody to perform a bogus test and publish it with their name on it....well, maybe you've had a little too much Kool-aid. When I stopped by Oakley's last October, he had a set of AFR 325's on the shelf for a customer. Does anyone know how they did? Also, when I talked to Racetec about pistons for a 75cc ARF325, they said the design only allowed for 15:1 comp. Does anyone know if pistons can be had with higher compression? Sorry to say Carl - you are the one drinking the AFR coolaid - and promoting the AFR products. I have no "skin in the game" that you clearly have. How do you explain a 521 P51 headed engine with a reasonably large solid roller cam falling on its face barely making 700 HP? I believe most here can separate very slanted advertising or "testing" vs. real world results. Carl, I found an AFR test of their 270 CC head vs a SCJ head on a Ford 521 crate short block. I think the cam was a 275/285 @ .050 etc etc. The AFR 270 made 722 HP I think. Were all these other results that you posted from the same day and test at Westech? I posted a link on the Bullet a few months back. There is no P-51 slant? Lem whats up with P-51 availability? When will they return? Are they done? Gary Blair wrote: Carl, I found an AFR test of their 270 CC head vs a SCJ head on a Ford 521 crate short block. I think the cam was a 275/285 @ .050 etc etc. The AFR 270 made 722 HP I think. Were all these other results that you posted from the same day and test at Westech? I posted a link on the Bullet a few months back. I wasn't there. Pretty sure Tony Mamo ran the whole deal. Maybe give him a call. He's running his own deal now, and no longer with AFR. You really think a 521 BBF with P-51 heads and a 275/285 solid roller will make no more than 700 HP peak? Maybe the Kaase test was faked or exaggerated? By how much in your opinion? You believe the AFR head is 75 HP better than the P51? Good grief if these AFR heads are 75 hp better than a P51 head it should be a piece of cake to get to 1100 hp. 68galaxie wrote: Sorry to say Carl - you are the one drinking the AFR coolaid - and promoting the AFR products. Skin in the game? I have no sales quota to meet with AFR, and the margins on their heads are paper thin. Frankly I couldn't care less what heads people use. I'm happy to supply whatever parts people want, but after building several engines with the AFR heads, I've found that dollar for dollar they're just flat the best stock style head available. No extra added rubbing needed, no never ending wait lists, just bolt-em on and go. If I were really interested in pumping people for max profit, I'd be pushing the heads that need extra work to make them right. Have you even seen the AFR's in person, let alone built an engine with them, or done any testing on them? Maybe you should do your own testing before calling other people liars and cheats. This series of tests were done on a 10-1 FRPP 521 short block. JK's and SAM's 521 was closer to 11.3-1 compression. Not sure on the HP difference yet. Going to study it more for sure. JK is a master engine builder. He is a master at the subtleties as well. You have to pay close attention . The AFR 285 is CNC finished. Is the P-51 as cast? The JK and SAMS 521 has ported P-51's. Just saying. Ported P-51's and CNC 315 AFR's @ 11.3 compression for both would be interesting. I'd like to see how both light up the scoreboard instead of racing dyno's. 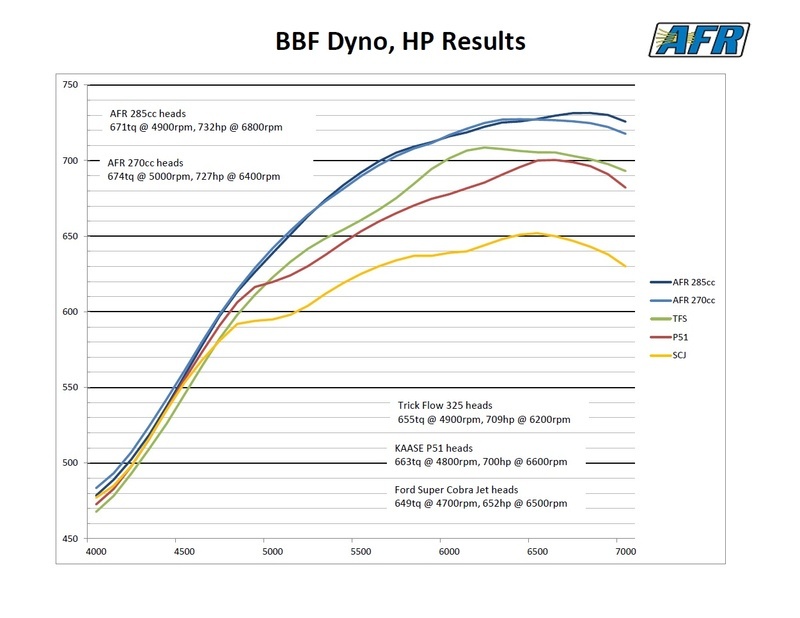 http://www.mustangandfords.com/how-to/engine/1505-big-block-chevys-beware-afr-270-bbf-cylinder-head-test/ This is the AFR 270 vs an as cast SCJ article. http://www.popularhotrodding.com/tech/0906phr_big_block_ford_engine/index.html SAMS/JK 521 P-51 build and dyno test. Just to make everyone remember that all these heads were created to perform well in DIFFERENT situations. The SCJ Ford Racing head was a STREET high performance head which COULD be used on a mild race engine. It was MEANT to be the best with a valve lift around only .700" or less; more lift does not help much on them. AND, to me, the P-51 is simply a glorified SCJ. It is very difficult to make any comparison of all these heads when they all perform best within their own realm and not so good in others. If anyone would be interested in setting up a dyno session to do our own comparison, I can offer a brand new set of AFR 315's and intake.